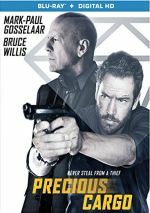 While Nicolas Cage remains the king of the direct-to-video film, Bruce Willis seems determined to give him some serious competition. For Willis’s latest straight-to-TV effort, we head to 2016’s Precious Cargo. Criminal boss Eddie Filosa (Willis) plans but then aborts a robbery. However, master thief Karen (Claire Forlani) goes ahead with the crime anyway – and earns Eddie’s enmity when she won’t agree to give him “his share” of the profits. The heist goes south and leaves Karen with nothing, but Eddie still demands restitution. In need of help, Karen looks up Jack (Mark-Paul Gosselaar), a fellow criminal and her ex-boyfriend. They do their best to stay alive and get Eddie off their backs, which leads to a new job. When I last saw Max Adams, he acted as the screenwriter for 2015’s Heist, a mildly entertaining semi-remake of 1994’s Speed. Cargo takes Adams to the director’s chair for the first time – and makes the mediocre Heist look like a classic. Cargo tries desperately to hearken back to slick, wise-cracking action flicks of the past. The script aspires to Tarantino-esque riffs and takes cues from a slew of other efforts, all in an attempt to bring us a quick, exciting experience. None of this works. As much as Cargo wants to be a clever, quick-witted romp, it lacks any of the necessary cleverness or intelligence to succeed. Instead, it feels like a loud, dopey approximation of a glib action movie. This means a relentless barrage of silly action scenes and absurd attempts at humorous dialogue, none of which gets delivered in an entertaining manner. During his brief time on screen – Eddie barely qualifies as a cameo - Willis looks embarrassed to be involved, and the others fare no better. Gosselaar tries his best, I guess, but he can’t approximate a leading man, and he finds himself stuck with a trio of badly flawed female partners. Always a lovely woman, Forlani still looks great, but she also still can’t act. Forlani seemed stiff and wooden when she debuted in the 90s and she’s not improved her craft since then. As hard as the script tries to make Karen into something of a femme fatale, she just seems like a personality-free dud. We also find Jenna B. Kelly as Logan, Jack’s sharp-shooting friend, and Lydia Hull as Jenna, Jack’s prospective new girlfriend. Both show even less acting talent than Forlani, which seems like a remarkable accomplishment. Maybe Kelly should get something of a pass, as she’s a recent convert from the modeling ranks, but she still becomes a liability via her inflection-free performance. Hull boasts more credits and experience but not more talent. One wonders why Jack chooses to surround himself with women who show so little personality or charisma. Cargo’s plot seems largely gratuitous. If you can follow it, you probably won’t care, as the story exists for no reason other than to motivate action. Actually, one of the set pieces works pretty well. A stunt sequence that involves trucks gives the movie its one minor shot of energy. Then it’s gone – and it takes any potential with it. Precious Cargo boasts very few positives, and I can see no reason to recommend this loud, aggressive and dull experience. Precious Cargo appears in an aspect ratio of approximately 2.40:1 on this Blu-Ray Disc. The movie offered a satisfying transfer. Overall sharpness worked fine. Virtually no softness appeared, so the film seemed accurate and well-defined. I witnessed no shimmering or jaggies, and the image lacked edge haloes. Print flaws also caused no concerns. Should one expect a teal and orange palette from Cargo? Yes, one should. Within those parameters, the colors appeared appropriate. Blacks seemed dark and firm, and I thought low-light shots portrayed solid delineation. This wound up as a pleasing image. Among extras, we get a collection of Cast/Crew Interviews. In this section, we discover chats with director/co-writer Max Adams (8:21), co-writer Paul Seetachitt (7:06), producer Scott Mann (5:02) and actors Mark-Paul Gosselaar (11:39), Claire Forlani (9:06) and Jenna Kelly (2:38). Across these, we learn about cast and performances, story and characters, the film’s development and Adams’ work as first-time director, and locations. The actors’ notes tend to seem fairly banal, so don’t expect much from them. The filmmakers don’t add a lot more, unfortunately – they give us a bit more detail but their remarks fail to offer a lot of depth. The “Interviews” remain fluffy most of the time. Making Precious Cargo runs 14 minutes, 37 seconds and offers comments from Mann, Adams, Forlani, Gosselaar, Kelly, Seetachit, and actors Daniel Bernhardt, Nick Loeb and John Brotherton. “Making” looks at the same topics as the “Interviews” – because most of the footage comes from the same sessions. Tons of film clips show up in “Making” and the featurette becomes an insubstantial bore. The disc opens with ads for Extraction, Heist, Misconduct, Exposed and American Heist. We also find the trailer for Cargo. When a movie’s title becomes its most clever element, it probably will flop. Such becomes the case with Precious Cargo, a film that suffers from a surfeit of flaws and never becomes even vaguely entertaining. The Blu-ray delivers solid picture and audio but the supplements lack substance. Even as a lazy day diversion, Cargo is a clunker.